Botox type effect on fine lines around eyes. 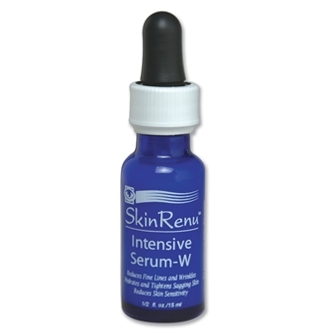 Reduce wrinkles with Intensive Serum W, anti ageing skin care formula. Contains a patented hexapeptide (six amino acids) that interferes with neuronal transmission in a similar way to Botulinum toxin and can have the same effect around the eyes, ie static wrinkle reduction. The hexapeptide is combined in Serum W with ingredients that enhance the natural lipid and collagen production so that the effect on static wrinkles is doubled – muscle relaxation and skin quality improvement. SkinRenu products will help you look younger, with real and lasting results. Proven, non-irritating formulations with active lipid complexes that will make your fine lines and wrinkles disappear. Your skin will be smooth and firm, with a healthy glow. Shake well. Fill Dropper. Apply to clean skin, using one drop around & under eyes. Follow with Anti-Wrinkle Fineline Reducing Formula. Repeat 2-3 time daily. Purified water (aqua), Hexapeptide-3, DNH Oil, Squalene, Glycerin, ethyl Gluceth-20, Acetyl Glucosamine, Propylene Glycol, Cyclomethicone, Dimethiconol, Octyl Cocoate, Phenyl Trimethicone, Ceramide 3, Soybean Sterol, Dimethicone Copolyol, Polysorbate 80,Carbomer, TEA, Germaben IIE.